Having a torn meniscus isn't the end of the world. However, it's an injury we must pay close attention to. Why? Because a torn meniscus left untreated can lead to painful arthritis. And arthritis can lead to abandoning some of the activities that you enjoy doing. The meniscus is a wedge-shaped structure in the knee that consists of fibrocartilage, a very tough but pliable material. It is the "cushion cartilage" of our knee. The lateral meniscus is located on the outside of the knee. Together, the medial and lateral meniscus act primarily as shock absorbers/stabilizers in the knee joint. They also help nourish the articular cartilage through their rich blood supply. This blood enhances the ability of the cartilage to repair itself. Here's a view of the meniscus (cushion cartilage of the knee). The Meniscus is a key component to participating in most athletic pursuits, from high-intensity sports such as skiing, basketball, and soccer, or even everyday recreational activities like walking, biking, or hiking. The Torn Meniscus - How Does it Happen? First, let's talk about the younger athlete. 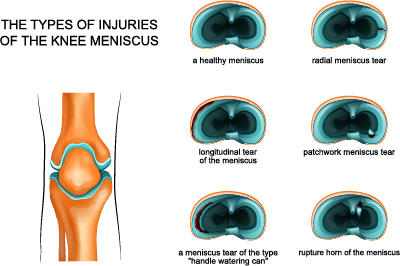 In young athletes, the majority of injuries to the meniscus occur as a result of some sort of trauma to the knee. Vulnerability to injuries in which there is both compression and twisting applied across the knee is high. Commonly the meniscus can also be damaged in association with injuries to the ACL. These activities can all cause major traumatic or cumulative stress upon the knee joint. These tears happen because the meniscus has a tendency to degenerate as part of the aging process. This degeneration often takes place in conjunction with early arthritic changes in the knee joint. It is also common for the meniscus to be damaged in association with injuries to the anterior cruciate ligament. A physical examination of the knee. Further diagnostic studies (like an MRI) may be required so we can get a three-dimensional image of the interior of the knee joint. In some cases, we may also recommend arthroscopic inspection of the knee joint, a minimally invasive surgical procedure. If you have a minor meniscus tear, these symptoms usually subside after 2-3 weeks. Pain when moving laterally, twisting or squatting. If you have a moderate meniscus tear, symptoms may subside after 2-3 weeks but may reoccur again when the knee is put under extra stress. 2. Severe symptoms are created when the torn meniscus folds into the joint space. Because of this, the knee will “lock up” or “catch”, feel wobbly or give out, and a significant amount of range of motion will be lost. Dr. Sterett talks about the two types of knee cartilage, Meniscus and Articular, and he explains the difference between the two. Other patterns of meniscus tears, especially in older patients, are not suitable for repair. If the patient is symptomatic and conservative treatment options like physical therapy are not working, surgery to remove the torn section is recommended. This surgery is called arthroscopic partial meniscectomy and is usually performed on an outpatient basis, typically in one hour or less. Your recovery timeline in the event of a meniscus tear depends on the severity of the tear, and on whether or not surgery is necessary. Each patient is unique, but most recovery from surgery in days or weeks. Along with surgery, there will be 4-6 months of rehab in order to regain function and strength. Meniscus tear rehab consists of exercises that strengthen the quadriceps muscle and help regain range of motion. Overall if you injure your knee and symptoms continue, it is important to see a specialist in order to find out if surgery is necessary. If it is determined that you do not need surgery, don't worry, because it isn't the end of the world. After some rest and a few months of physical therapy, we will have you up and moving at full speed, back doing the things you love. Do you need two surgeries for an ACL and Meniscus Tear...or can it be done with one?